The producers of Saved By the Bell were clearly into recycling. 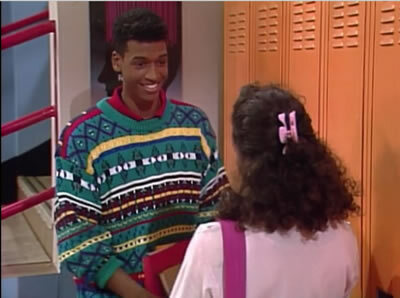 ...was most definitely a Zack Morris hand-me-down from a year earlier. That is one unforgettable sweater. I remember both episodes(I'm a big fan of the show). I'm kind of ashamed to admit, I had a thing for sweaters like this in my early teens(I had some bad ones) I am actually watching the series on Netflix streaming. I am up to episode 19 in season 2. Such a great show! Jason -- I've been doing the same on Netflix. Just finished the last of them a few days ago. Seen them each dozens upon dozens of times before but still watched every last one.